IMAGINE A WORLD where the slot machine can be utilized in new ways to unlock greater value for you and for your players. That is the game-changing technology called FUZION. When you connect JCM’s new GEN5 printer and the iVIZION bill validator to your compatible back-end CMS, you unleash the power of FUZION. Every machine on your slot floor has the potential to deliver a server-driven suite of player-focused, revenue-driving features. FUZION could turn every slot machine into a multi-line profit center, with lottery tickets, sports wagering, promotions, and more at your players’ fingertips. 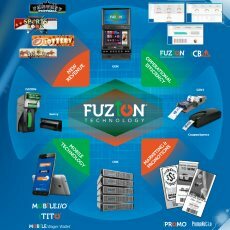 FUZION is at the core of the future-ready casino floor.